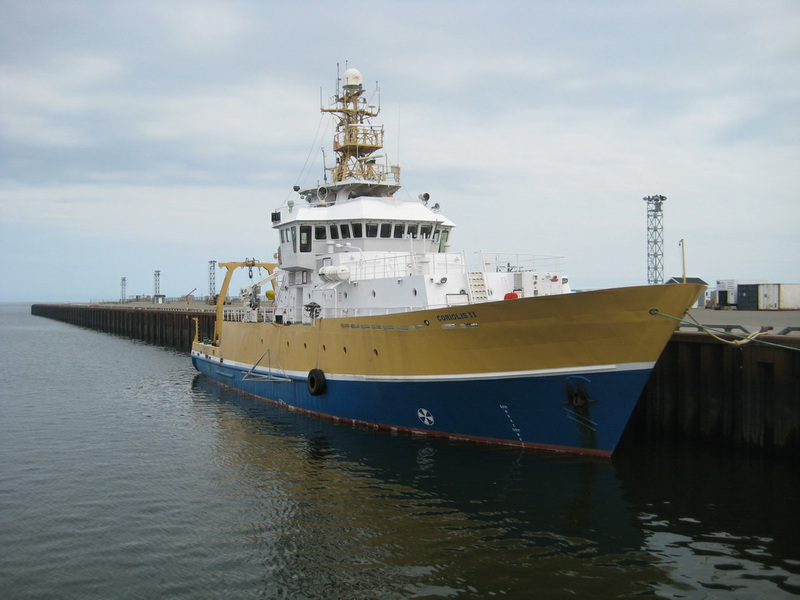 Seaforth Geosurveys Inc has a long-standing relationship with vessel operator Reformar, utilizing the RV Coriolis II for a variety of survey operations worldwide. On board, the vessel is configured to operate various geophysical instruments including two hull-mounted multibeam echosounders, sidescan sonar, subbottom profiler, magnetometer, USBL, multi-channel seismic data acquisition and processing systems, and geotechnical sampling equipment. The Coriolis is also equipped with a dynamic positioning system, providing excellent station keeping for geotechnical operations and as an ROV support platform. The RV Coriolis II has been operated by Reformar since 2002. It was built by the Canadian Coast Guard and designed for research and rescue at sea. It’s certified for operations in both domestic and international waters, and currently makes berth in Rimouski, Quebec. Seaforth has established a collaborative research and development agreement in with the Institute of Marine Science of Rimouski (ISMER). As a direct value added component to the long-term RV Coriolis II vessel charter, this unique relationship provides access by Seaforth to the capabilities of and support from the institute at the University. Seaforth and ISMER work together on projects of mutual interest as well as providing direct project support both offshore and through the extensive capability of ISMER’s analysis and testing laboratories. Seaforth also supports the Canada Research Chair in Marine Geology at ISMER. In recent years Seaforth and the Dalhousie University Marine and Environmental Law Institute (MELAW) have cooperated successfully on Law of the Sea projects for various clients including the governments of Nigeria and Pakistan, and have now developed a framework agreement to strengthen their relationship and to provide a mechanism for undertaking future cooperative activities. In this partnership, Seaforth offers its consulting engineering services and specialization in the development and implementation of innovative marine geomatics engineering services, with a focus on. United Nations Convention on the Law of the Sea (UNCLOS) related surveys, consultancy and capacity building. MELAW, recognized globally for excellence in marine and environmental law teaching, research and capacity-building, provides advisory services to agencies of the United Nations and regional organisations as well as assisting government departments and non-governmental organisations in Canada and internationally. Seaforth and Seaward Engineering & Research Ltd (Seaward) have a cooperative understanding for the sharing of resources, providing Seaforth with vessel support and engineering services on the Canadian west coast. Seaward provides project management, consulting engineering and research & development services to the marine, industrial and environmental sectors both in Canada and worldwide. All engineering research and development projects can be taken from concept to prototyping. Field studies, either hydro-geomatic or environmental, can be designed and implemented by Seaward with full data processing. Seaward also provides full discipline engineering services from plant layout and preliminary engineering studies through to detailed engineering, fabrication monitoring and verification including on site construction management and start-up services. Seaforth has established a collaborative working relationship with Techno Dive, who Seaforth partners with on projects in Uruguay and South America. Techno Dive is a privately owned diving and salvage company that has been providing underwater services and operating vessels for maritime industry since 1987. This unique relationship provides Seaforth with the diving capabilities and vessel support of Techno Dive. Seaforth and Techno Dive work together on projects of mutual interest with each company’s capabilities enhancing and diversifying the range of services we can offer to potential clients.